Posted on October 8, 2012 at 11:07. Depending on the environment, there are different requirements for user interfaces and how people need to interact. 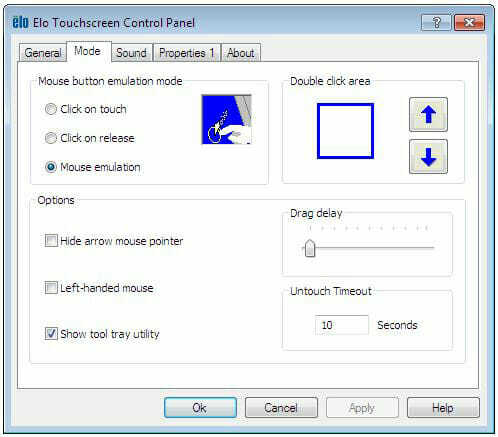 Recognizing this, Elo added a few features to their drivers that provide some advanced functionality to enhance usability for very specific purposes. Some interfaces require that the end user only perform a single momentary tap or click with no desire to drag anything or no need to “click and hold” for any amount of time. A good example would be a motor toggle or a machine that requires fine tune adjustments by just one tap or click at a time. This feature is particularly effective if your user interface requires only a single instant click. Other customers may find they need to be very careful about the location of their touch and as a result need to be able to touch the screen, adjust their finger location, then release to register a single click. This particular feature can prove useful when you need to make sure the cursor is in an exact location or if timing needs to be impeccable upon release. Another feature unique to this mode is its ability to display a taskbar that has been set in Auto-Hide mode. This is very useful for customers who want to be able to access more of the operating system but want a full-screened HMI program running most of the time. Very often in industrial environments it’s absolutely vital that a user wear large gloves, which can make some ordinary tasks with common operating systems very difficult. To make matters worse, trying to touch near the edges of a screen can be almost impossible with gloves on. 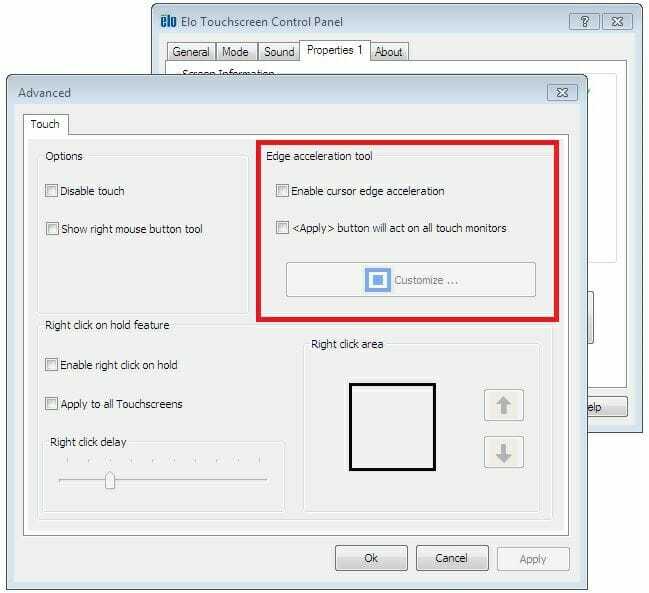 To aid in this area of functionality, there is a very nice feature that, as you move your finger closer to the edge of the monitor, will accelerate the motion of the cursor further towards the edge enabling the cursor to click in those hard the reach areas. In any type of environment, a touch screen can be a powerful tool to increase productivity and avoid additional hardware when necessary. Elo strives to make it easy and precise no matter what you need to do and no matter what type of interface you’re using.